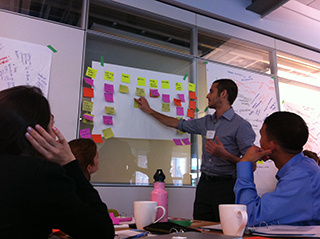 The Natural Step Canada has long been a respected provider of sustainability training. We have built and maintained a reputation for doing something different, impactful, and perhaps surprisingly… fun! I hear that every time I’m at a training. Why do participants feel our approach is so innovative and engaging? First of all, the way to many people’s hearts is through their stomach. Or mouth. (How does that saying go?) We are intentional about our food. Wherever possible, we go the distance to provide local, organic and super tasty vegetarian food. 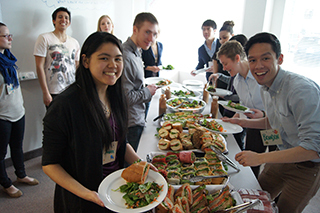 At times, we’ve treated 100+ attendees of a 2-day conference to a vegan buffet. We search for like-minded partners who strive to make a positive difference in the community. Often this means they are employing individuals who face barriers to employment or are otherwise respected leaders in social and environmental change. Especially during our IMPACT! Sustainability Champions Trainings for youth, it’s not uncommon for 75% of the final open-ended feedback question comments to include kudos to the food and those who lovingly prepared it for us. Serving vegetarian (and occasionally vegan) food catalyzes a discussion on how our food choices influence our carbon and sustainability footprints. We’re learning even at lunchtime. This is just part of how walk the talk, and help each other find opportunities for improvement. We start conversations with service providers as we enter new communities: Can you compost or redistribute any of the leftover food? Can we avoid disposable containers? Can we reduce the sugary snacks? We don’t always get our ideal, but more often than not, we help prompt caterers to think outside the (disposable) box. So, while we aim to excel on food provisions, we of course need to – at the very least – hold their attention until lunchtime! Our curriculum and facilitation are carefully constructed using principles of adult learning. Our facilitators are trained on these principles. Many have also been through the Art of Hosting and Harvesting Conversations that Matter trainings, and some have complimented this with training in Authentic Facilitation, as well Outward Bound’s experiential education model. All of us are 100% passionate and driven to design the best possible learning opportunity. For us, using the principles of adult learning and Art of Hosting means we can create opportunities to get out of our seats, move around, and share experiences and personal stories with others in the room. In both literal and figurative ways, we ‘flip the classroom’. I may never forget a recent workshop where the university facilities staff watched my colleague and I dismantle the room they had just carefully arranged. (We do try to avoid this but occasionally our requests for set up are lost in the shuffle.) Rows of tables turned into group workstations. Tablecloths and wasteful free notepads were all removed and returned. They were instead replaced with flip chart paper ‘tablecloths’, a variety of coloured markers and a stack of post-it notes. The staff didn’t know what to think. To be frank, I’m continually surprised why this simply isn’t the norm for learning set up. Despite our expertise, we never imagine all of the learning to come from our facilitators. We intentionally create opportunities for a significant amount of peer-to-peer learning. Adult learning happens best when individuals can learn by doing and sharing, using realistic challenges with minimal instruction. In some of our courses, we have groups work through a practical case study – sometimes this is live, with a case study organization representative in the room, sharing their challenge and commenting on the participants’ ideas. Sometimes, like in our Level 1 courses, we use a theoretical case study to warm everyone up and allow them to practice together on an example that they can all relate to. We then provide space to consider how the approach we teach, the Framework for Strategic Sustainable Development (FSSD), can be applied to challenges they are facing in their day-to-day activities. The great thing about the FSSD is that you can apply it to anything – assessing a product, a project, an organization, a community, a sector, a country, or the world. It’s incredibly flexible. Just like learning the basics of how to ride a bike, once you’ve learned the skills in the backyard, you can later take your adventure all the way across Canada, much like two of our training graduates have done. This fall, we have an extensive buffet of carefully crafted learning opportunities for you to taste from. Whether you are a student or recent grad with a project idea, a professional with direct or indirect sustainability responsibilities, a webinar aficionado, or a YouTube grazer, we’ve got something in store for you. Take a peek through our newsletter or visit our homepage for more information on which options are the best fit for you. If anything you see prompts questions about a custom course for your area or organization, please do get in touch with me.